I have gone to Boracay via the nautical highway and also on board the Superferry but I have never been there via a plane. I know its a hassle not going there by plane but what can I do considering that budgetary constraints prevent me from doing this. Wouldn't it be great if I do get there via Seair this time? 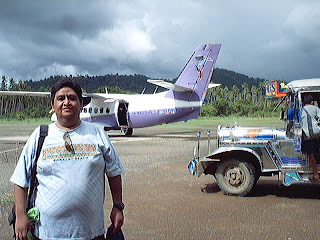 Actually, I have already flown Seair twice, one is the El Nido - Busuanga (Palawan) and the other is the Manila - Romblon route. It is a nineteen seater affair with a complement of two crew. The El Nido-Busuanga flight was one leg of our journey when we visited various campuses of state universities in Palawan from as far south as Bataraza to Busuanga in the north. The Romblon trip was upon the invitation of Romblon State College for the DBM Secretary and our Regional Director to be keynote speakers in their commencement exercises. I understand that on the Boracay route, Seair uses the bigger 32-seater Dornier 328 plane and that ivanhenares is giving a free return trip ticket to Boracay. Now, wouldn't it be great if I get to ride on one of this bigger plane?